Birmingham City's in-form striker Lukas Jutkiewicz deserves his recent run of success, says Blues boss Garry Monk. The 29-year-old has netted eight goals in seven games - seven of which have come at St Andrew's - and five times in October to help earn him the accolade of Championship Player of the Month. But Monk says there is more to the big striker than just his goal-scoring. "It's just reward for him because it's not just the end product, the goals that he's scored," Monk told BBC WM. "I'm delighted for him, as is everyone at the club. It's thoroughly deserved. Since I've come in, he's been at a high level for a consistent period. "People might say he won that because he scored x amount of goals but, if you watch his all-round contribution, it's more than just the goals. "There's a big demand on all the players, especially his position. But his strengths are coming out. It's Jukey's professionalism and character. "He's not the most vocal lad but he leads by example. When he does speak, he speaks with intelligence and experience." 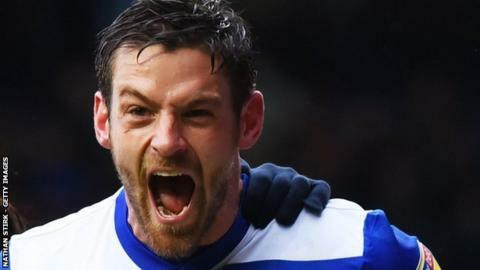 Jutkiewicz was a success when Gary Rowett first brought him to St Andrew's from Burnley, initially on loan in 2016, matching his season's best tally of 12 goals. But he lost his way in the confusion which followed Rowett's departure, and failed to flourish under Gianfranco Zola, Harry Redknapp and the more defensively-minded Steve Cotterill, who invariably played with just one striker. But, fuelled by the four goals he scored when Monk arrived at the back end of last season, Jutkiewicz has now hit top form to help Blues to 13 points out of a possible 15 in October, earning him his award, as well as a manager of the month nomination for Monk. Lukas Jutkiewicz's current run at St Andrew's of seven goals in four games is the best home run by any Birmingham City striker since Kevin Phillips (Nov-Dec 2008). Another goal at home to Hull City on Saturday and he would match Gary McSheffrey (who scored in five successive league games, Oct-Dec 2006). Jutkiewicz has scored 13 goals in 27 games since Garry Monk took over, nine this season - and 84 in his entire career. But he has never scored more than 12 in a season, although he has done that three times - at Motherwell in the Scottish Premier in 2009-10, with Coventry City and Middlesbrough in 2011-12, and then again for Gary Rowett's Blues in 2016-17. Like many of the current Blues squad, Lukas Jutkiewicz has experienced some turbulent waters since arriving at the club. Too often a frustrated onlooker during the Zola, Redknapp and Cotterill eras at St Andrew's he has positively thrived under Garry Monk and his staff. An ever-present in the Championship this season he has been encouraged to concentrate in his strengths, and Jutkiewicz's burgeoning partnership with Che Adams has been a key part of the club exceeding expectations up to this point. Never flashy, utterly committed and a thoroughly good professional, this award will be very popular throughout the Blues camp.